What is a senior honors thesis? The senior honors thesis is an opportunity for you to formalize your undergraduate research experience. This is an opportunity for you to explore the unknown with the help of a faculty mentor. Unlike traditional courses, you get to participate as an independent scientist, working on geologic problems that are not yet solved and learning new skill sets (modeling, geochemical analysis, field work, etc.). During the senior honors thesis, you will learn to identify key problems or questions, delve deep into the literature, develop a scientific methodology, collect and analyze data, and finally interpret your results. You will also hone your skills in written and oral communication of your science. The experience will help you decide what you might want to pursue in graduate school or elsewhere, such as industry and other fields. Undergraduates are encouraged to embark on an undergraduate honors thesis. The purpose of the honors thesis is for students to develop and demonstrate their creative and independent research potential. Students are recommended to begin in the fall of their junior year to provide ample time for research projects to be developed, executed and written. 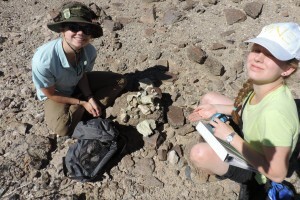 Students are expected to enroll in at least two semesters of the course ESCI 481 Undergraduate Research in Earth Science, spanning their senior year. Juniors who have identified a research project and mentor can also enroll in ESCI 481. Students should sign up for ESCI 481 for 3 credits, under the expectation that they will be dedicating a commensurate amount of time to their research project. Tectonic history of Enceladus and it’s ties to the formation of the tiger stripe fractures. Students who are accepted into the ‘Rice Undergraduate Scholars Program’ (RUSP) can substitute ESCI 481 courses for semesters 2 and 3 with HONS 470 and HONS 471. However, the students will have to meet all other requirements of the honors thesis set by the EEPS department. Students must apply and be accepted to participate in the senior honors research program. The application form can be downloaded from this website, and should be submitted along with a thesis proposal of approximately two pages in length by the end of the spring semester of the junior year. Students will usually be informed of their acceptance into the honors thesis program within a few weeks of their application.